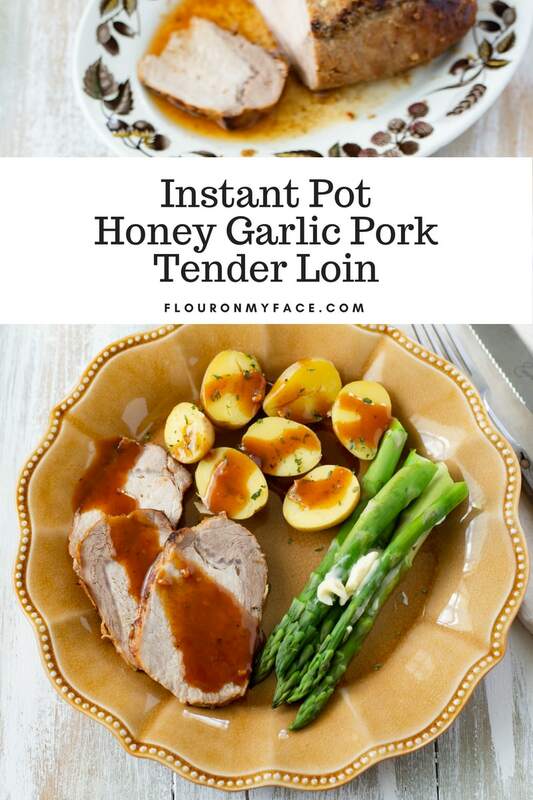 Instant Pot Honey Garlic Pork Tender Loin is moist and tender. Has the instant pot revolutionized your cooking? 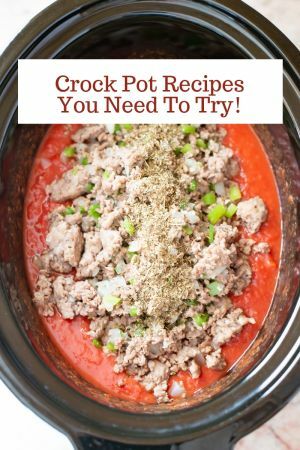 I am amazed at how fast and easy it is to get dinner on the table when I make my Instant Pot recipes. Cooking a pork tenderloin in the Instant Pot takes hours off the cooking time. 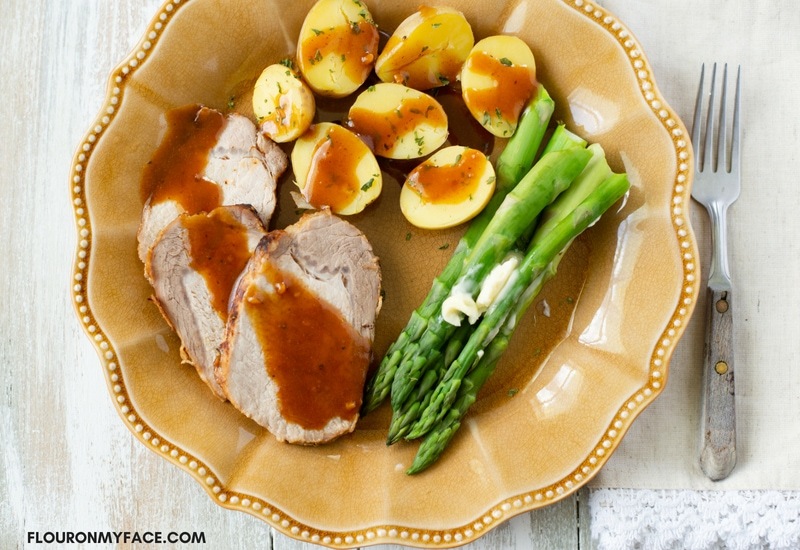 You can serve this easy instant pot pork loin recipe in under 30 minutes! If you own an Instant Pot you are probably in love with it. If you use it that is. 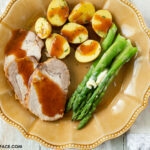 You have got to use the Instant Pot to appreciate the quick and delicious meals like this Instant Pot Honey Garlic Pork Loin recipe that you can make in way less time in the electric pressure cooker. Normally, I would roast a pork tenderloin in the oven for about three hours. I can’t believe that the same meal that would normally take me 3 hours to roast can be done in less than 30 minutes in the Instant Pot. And that includes the time it takes to make homemade gravy! 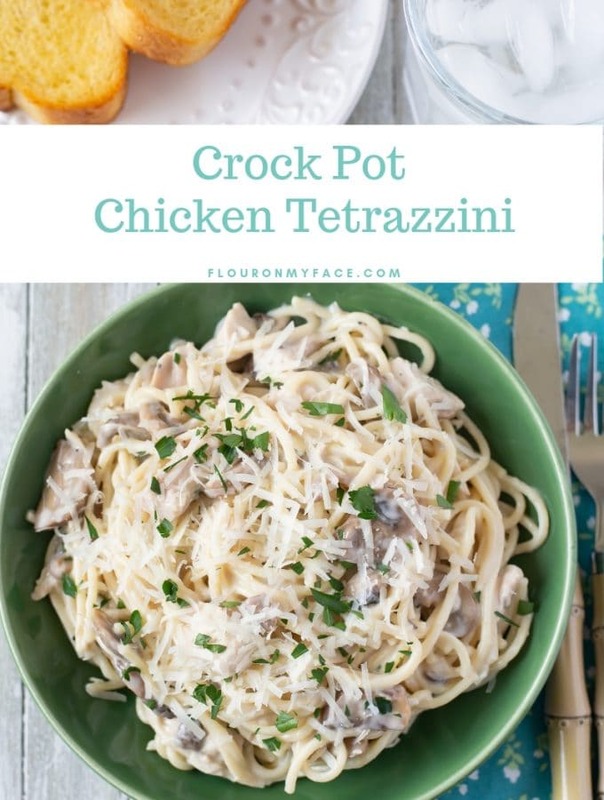 The more I use my Instant Pot the more I fall in love with it. 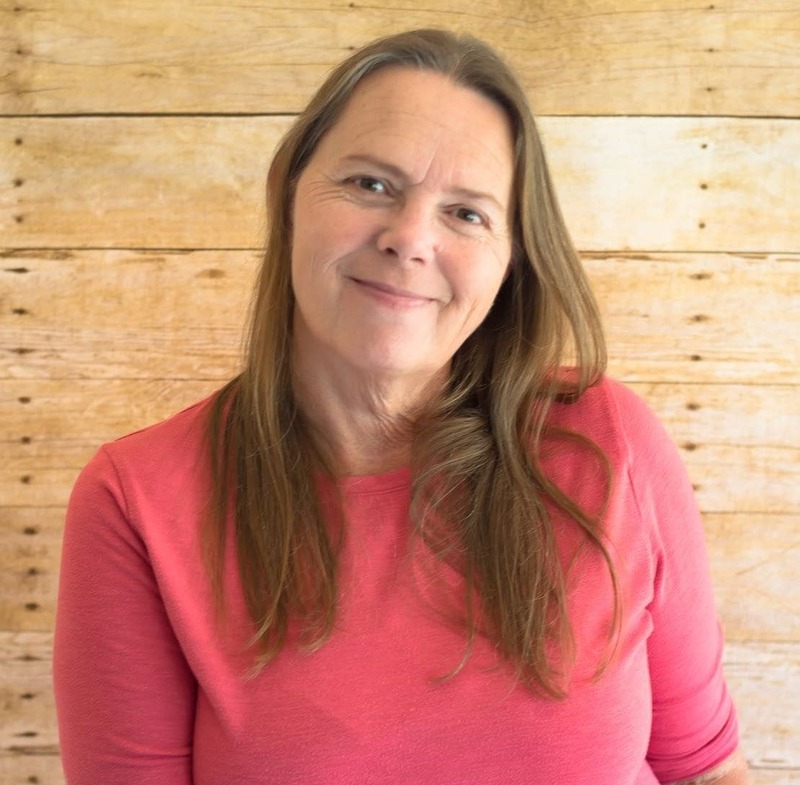 The Instant Pot is a working mothers dream come true. It was so hard for me to get dinner on the table after a long day a work. If only the Instant Pot had been around back when I was a working mother working outside the house. Place the Pork Tenderloin in a lidded container. In a small bowl mix the honey, Dijon mustard, minced garlic, black pepper, and salt. Use a whisk to combine the pork marinade ingredients well. Pour the honey mustard marinade over the pork, cover and marinate in the refrigerator for a couple of hours or overnight. When ready to cook, heat the Instant Pot on the saute setting and melt the butter. Remove the pork tenderloin from the container saving the marinade. Place the pork tenderloin into the Instant Pot and saute until browned on all sides. Remove the piece of pork from the instant pot and put the rack in. Place the pork tenderloin on the rack. Add the reserved marinade to the Instant Pot along with the chicken stock. Place the lid on the Instant Pot and make sure the valve is set to the sealed position. Press the manual button on the Instant pot and set the cooking time to 8 minutes. Once the Instant Pot has beeped and the cooking time is over allow the Instant Pot to naturally release the steam for 10 minutes. Carefully open the Instant Pot and remove the Pork tenderloin and place it on a serving platter. Allow meat to rest while making the gravy. Turn the Instant Pot on the saute setting. Mix the water with the cornstarch in a small bowl. Once the liquids in the Instant Pot start to boil pour the cornstarch water into the Instant Pot. Use a whisk to mix the gravy until it thickens. Turn the Instant Pot off and unplug. Carefully remove the gravy from the Instant Pot with a ladle and pour into a bowl or a gravy boat for serving. Slice the pork right before serving. 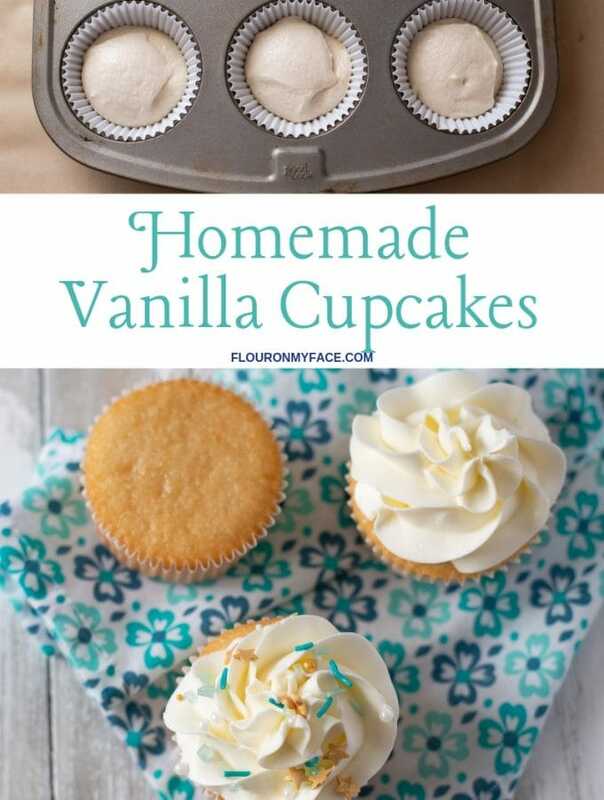 Makes 6 to 8 servings. 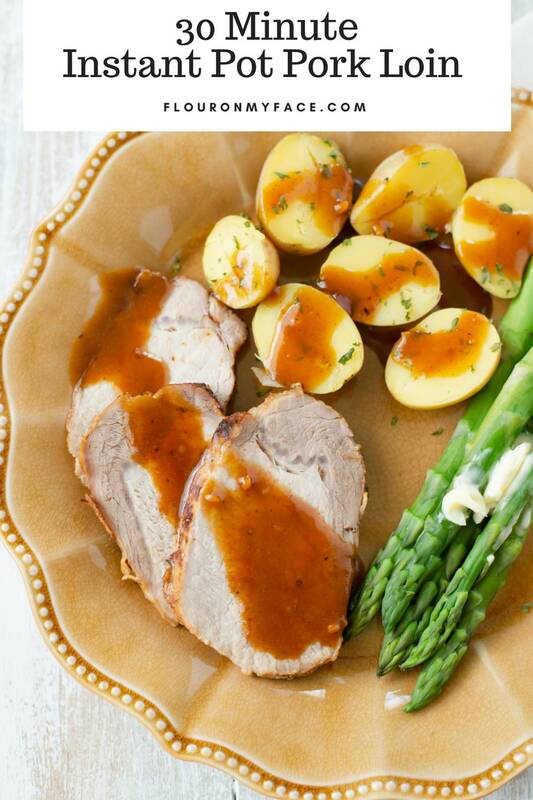 Serve the Pork Tender loin with the gravy along with potatoes and asparagus. The longer you can marinate the pork tender loin the better. Allow the pork tender loin to rest at least 10 minutes before slicing. 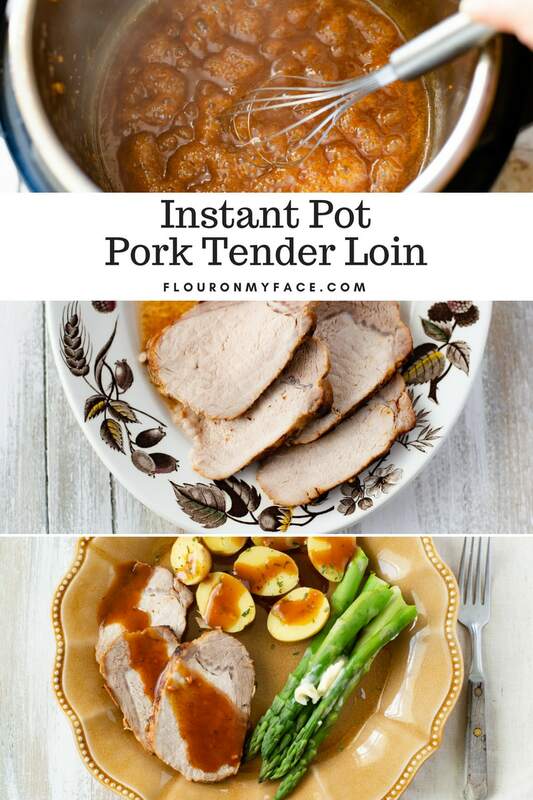 This easy pork instant pot recipe makes a fast and easy week night meal that is done in less than 30 minutes. 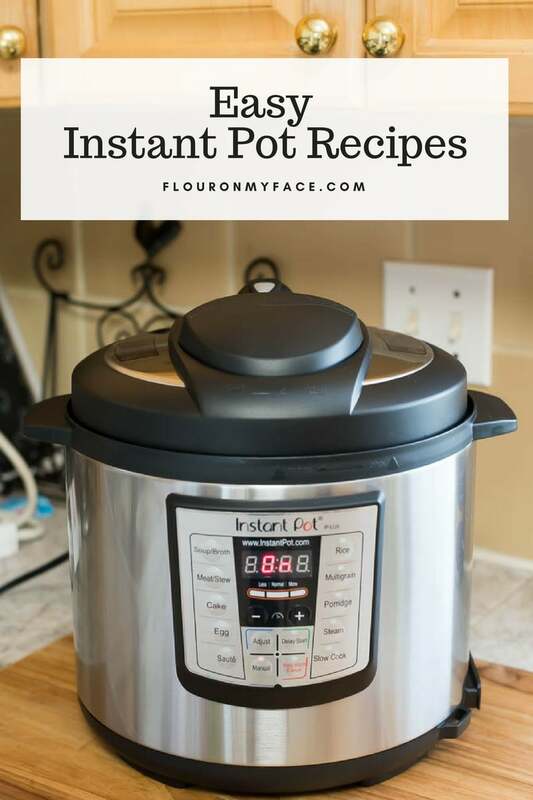 The Instant Pot is perfect for busy working mothers who need quick and easy dinner ideas. 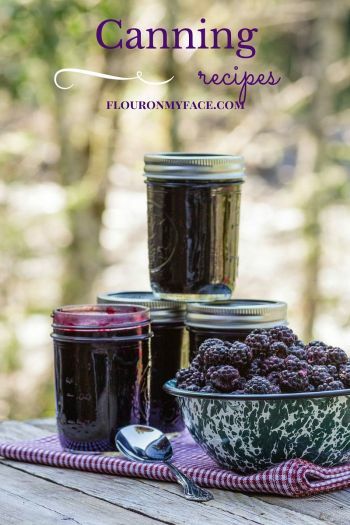 Have you checked out the Flour On My Face Instant Pot recipe page? 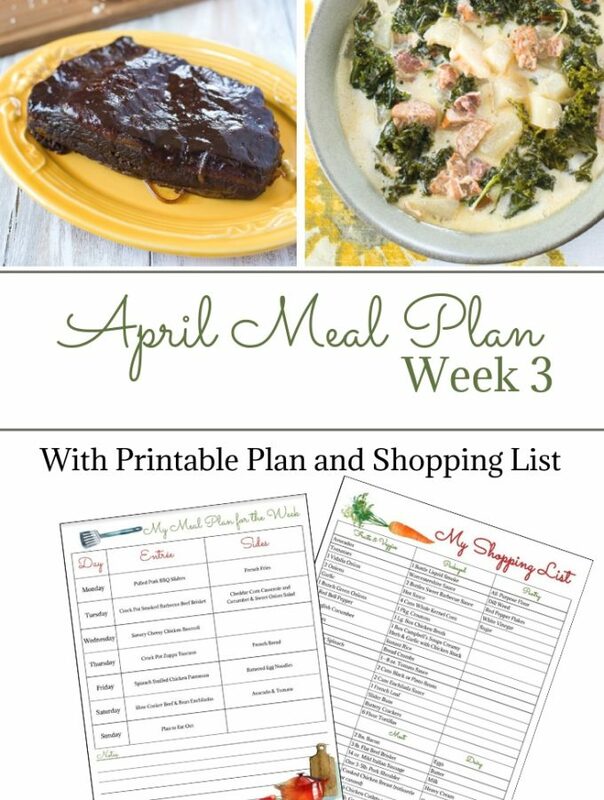 It’s where I share all of my instant pot recipes so busy mom’s can go right to one page to find the perfect instant pot recipe for dinner. Cindy yes you can make this in the oven. Follow the directions for marinating then place the pork tenderloin and marinade in a baking dish, cover with aluminum, roast in a preheated 350-degree oven for 2 to 3 hours, depending on the size of the pork tender loin.